A visit to Muckross Gardens is top of the list for many that visit or live in Killarney. The fabulous setting on the shores of the Middle Lake in the grounds of Muckross House makes this one of the most popular areas of Killarney National Park. If you want to go on a great run that takes in beautiful gardens, mountains, lakes and woodlands, then the Muckross Gardens 5k route is just what you need. Located about 6km outside of Killarney town, Muckross Gardens and Traditional Farms can be reached by various forms of transport. 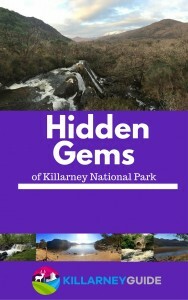 There is a paved path from the outskirts of the town that goes through the National Park all the way to Muckross House. The path is shared by walkers, cyclists and the traditional jaunting cars. Jaunting cars can be hired from the town centre and there are a number of locations to rent a bicycle if you need one. There is ample car parking at Muckross house. There are also a number of buses stopping at Muckross House. For this run, the start and finish point will be the main car park at the entrance to the Traditional Farms. This run has virtually no inclines and is generally flat throughout. There are some ups and downs as you meander through the woodlands. For those that are not too fond of the hills, this is the perfect course for you! If you are doing the run in the winter months, the woodland trail section can be mucky in parts so dress appropriately. January, February, March, April November, December – Closing Time: 6pm. May, June, September, October – Closing Time: 7 p.m. July, August – Closing Time: 9.30 p.m. If you are driving, be sure to check these times as the gates automatically close and it could be a costly mistake that requires a call out fee to release you! The run starts by heading across the car park past the Muckross Traditional Farms. Follow along the gravel path, passing the old Muckross Schoolhouse until you reach a T junction. Turn left here and proceed across the parklands. During the summer months, the native herd of Kerry cows will be grazing either side of the path. As you reach the crossroads, take a left turn along the long drive that leads back to Muckross House. Follow the path all the way up the long drive to the House. Torc Mountain and Muckross Lake will open up on your right hand side as you reach the jarvey stand at Muckross House. Follow the path to the right, down towards the lake shore below. The path turns to skirt the shore of Muckross Lake, also known as the Middle Lake of the three Lakes of Killarney. As the path heads back into the woods, you will pass near to starting point for the old Boathouse walking trail. Continue along this path and you will soon reach the 2km point of the route. Tip: If you are running this during the peak summer season, the path will be busy with walkers, strollers, cyclists and horse drawn jaunting cars. There is a woodland trail parallel to the main path that begins near the start of the Old Boathouse Trail. Before long, the path opens out from the woods along the shores of Muckross Lake. Ahead of you, the forested slopes of Torc Mountain rise up from the lake shore. To your right, the peaks of the McGillycuddy Reeks peek out from above the nearby Lough Leane. This section of the path is quite open and can be very exposed on a windy day and is equally glorious on a sunny summer’s day. Follow the path that leads you closer to the base of Torc Mountain. As you approach the shelter of the trees again, stay left to continue in parallel with the main N71 Ring of Kerry road. The sounds of the cars and buses compete with that of the water cascading down at Torc waterfall just metres away. Follow the paved path as it winds back towards the woods that surround Muckross House. Soon the tree cover thickens and you are deep within the woods once more. Watch out underfoot in this section as it is rough and uneven and can become mucky and sticky after prolonged periods of rain. The old stone walls of the Muckross estate will guide you along the path until you reach the road that is the main vehicular driveway to the House. Take a left here, staying on the pedestrian track along the roadside. As you roll down the hill for the last few hundred metres, you will arrive at the familiar surroundings of the main car park where we started. This Muckross Gardens 5k run offers a lot in the way of scenery on various sections of the route. Its variety is not limited to scenery alone. There are open exposed sections mirrored by secluded sheltered woodland trails. There is a good chance of seeing some of the native red deer en route – a very close encounter on one occasion nearly resulted in cardiac failure for both man and beast! The bustling epicentre of Muckross at the start and finish is contrasted by the quiet solitude of the woodlands and the paths at the foot of Torc Mountain. To experience the magic of Muckross, make a date to take a spin around the Muckross Gardens 5k.